Scientific illustration of brown algae made in negative(white drawing on black paper), during drawing process I was exploring textures and different types of algae. Algae is an informal term for a large, diverse group of photosynthetic organisms that are not necessarily closely related, thus polyphyletic. 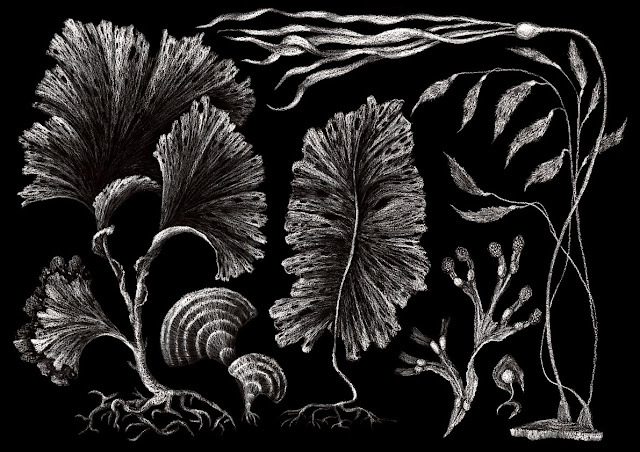 Included organisms range from unicellular microalgae genera, such as Chlorella and the diatoms, to multicellular forms, such as the giant kelp, a large brown alga which may grow up to 50 m in length. Most are aquatic and autotrophic and lack many of the distinct cell and tissue types, such as stomata, xylem, and phloem, which are found in land plants.